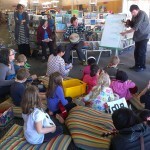 Tawa Library had a large number of budding musicians at their holiday activity this week. 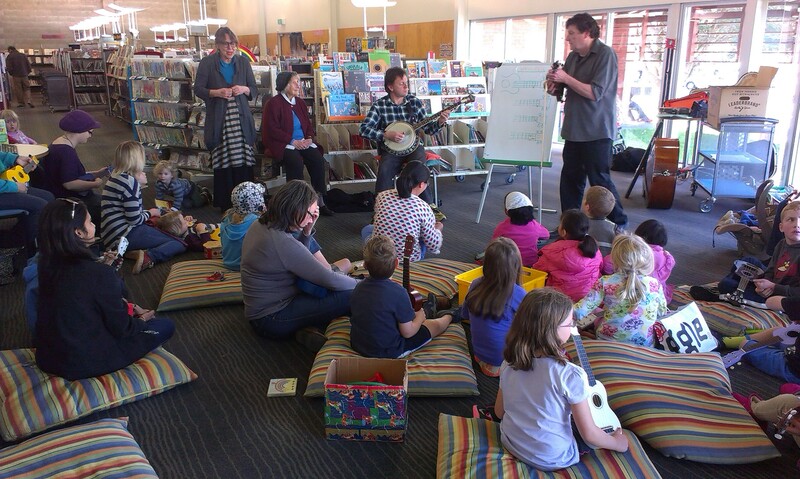 There were strings galore, double bass, violin, banjo and then the ukuleles’ came out. 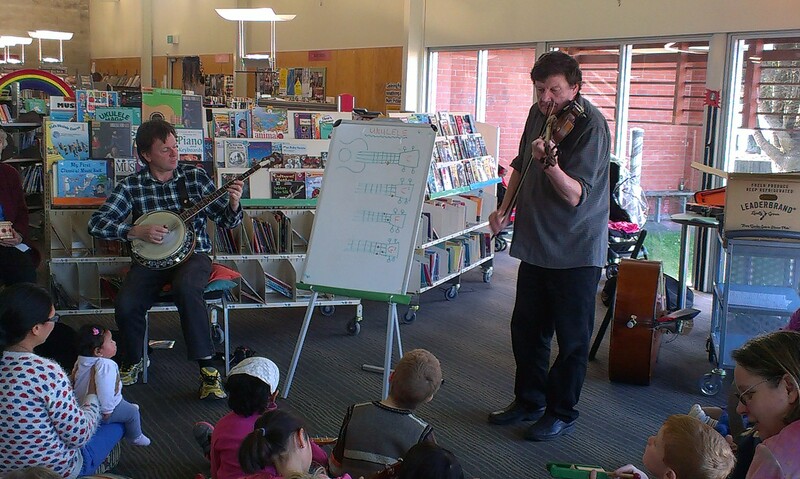 A big thank you to Rich and Daryl who led the way teaching us musical cords so we were able to join in together to became part of the great Tawa Library Orchestra. Our musicians started at 3 years of age and went all the way up to 93 years. Check out the other cool free holidays activities at the Children’s Events webpage. 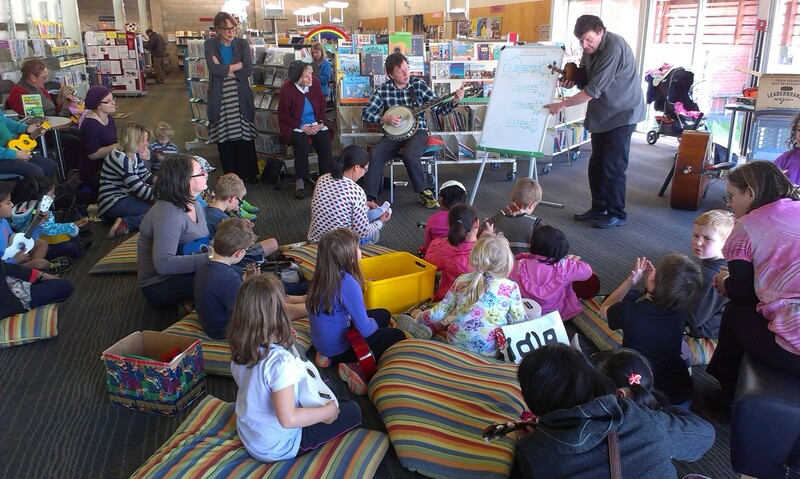 Make sure you come along to our monthly Friday night storytime at Johnsonville Library where this month its going to be all about music. This musical extravaganza will be on Friday 1st May starting at 6.30pm and will include lots of stories and of course music. So come along for some melodious, musical madness! 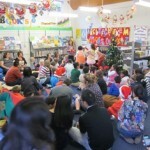 Children’s Christmas DVD’s and CD’s to enjoy. A Family Christmas: This is a Putumayo compact disc filled with different Christmas songs like Santa Claus is coming to town, Holly Jolly Christmas and Is that you Santa Claus. 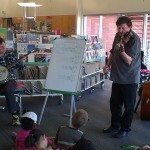 There are many favourite songs to dance and sing along to, plus new songs to learn. Christmas for Kids: This CD has some old favourites for children of all ages. Like Jingle Bells, Away in a Manger and I saw Mummy kissing Santa Claus. There are also Australian classics like Six White Boomers, Christmas where the gum trees grow and Christmas on the station. Q. How many Christmas presents can Santa fit in his empty sack? A. One present. After that its not empty anymore. Christmas is here again. This DVD is about the evil Krad who steals Santa’s presents and slowly crushes the Christmas spirit. The children of the world forget about Christmas. An orphan and his friends travel to the South Pole for an adventure to try and stop Krad once and for all destroying Christmas. The Muppet Christmas Carol: This DVD is a special version of the Christmas Carol starring the lovable Muppets. It has Kermit the Frog as Bob Cratchit and Miss Piggy as his wife. There is also Gonzo as the lovable Charles Dickens narrating the story. Many other favourites include Fozzi Bear and the two hecklers as the Marley brothers. Ebenezer Scrooge is played by a human actor, Michael Caine. 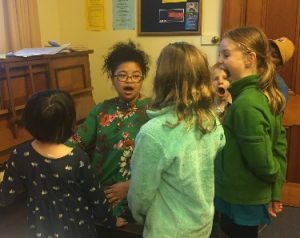 There are some lovely tunes and it is a wonderful version for the whole family to watch – but beware there are a few scary bits. Q. What goes oh, oh, oh? Countdown to Christmas: This DVD is from our favourite Disney characters with 7 different Christmas themed stories. Join Micky Mouse, Donald Duck, Goofy and all the friends. Dorothy the Dinosaur rocking Christmas: Join Dorothy and all her Wiggles friends on this DVD. You will have a rocking good time with all this Christmas music. Sing along and dance to it. 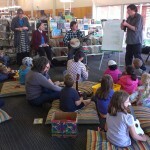 Children’s Top 10 CDs for May – Happy New Zealand Music Month everyone! 7. Fun times : An ABC Music CD. Christmas carols have a long and surprising history. In the very early days of the Church, songs weren’t sung during the Christmas period. It was believed that Christmas should be celebrated in a very sober way, not like those pagans with their raucous midwinter festivals! The word carol comes from two places: the ancient Greek choros (“dancing in a circle”) and the French carole (“a song to accompany dancing”). So carols were basically any song that was sung at any time of celebration. When people started singing in Church, they’d often get kicked out by an annoyed priest, so they went around to people’s houses instead. That’s why in some countries carol singers go around streets singing songs. It was only during the 15th century that people started writing carols specifically for Christmas, and singing them was allowed in Church. A lot of the songs we still sing today are very old. “The twelve days of Christmas” and “We wish you a Merry Christmas” are from the 16th century. Then there are some from the 18th century, like “Hark the Herald Angels sing” and “O come all ye faithful.” Most of these very old Carols are English or French, but there are a few from America too: “Jingle Bells” and “Away in a Manger” were written there in the 19th century. Another carol from that period, “Silent Night” has quite an interesting story behind it. It was written in 1818 in Germany. At its first performance it was supposed to have been accompanied by the organ, but mice had chewed through the bellows so it had to be accompanied by a guitar instead. During the “Christmas Peace” of 1914, during WWI, it was sung by English, French and German troops as they all knew the melody and the words. Although obviously they sang it in their own languages! 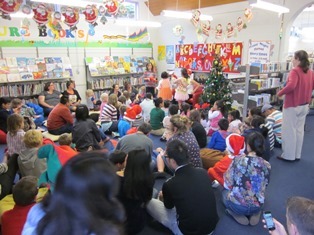 We’ve got lots of awesome Christmas music at the library, so come down and check them out. Most of my information for this post came from The Christmas Almanac and Horrible Christmas.